If you’re like most designers, you’re probably most comfortable tackling the early stages of the design process in a desktop app like Photoshop or Sketch. This can be a great way to handle the process as it minimizes the number of choices you have to make within Webflow, speeding things up even more. But unfortunately, it can also mean a lot of duplicative work. With that in mind, here’s how I make the PSD-to-Webflow design process faster and easier. 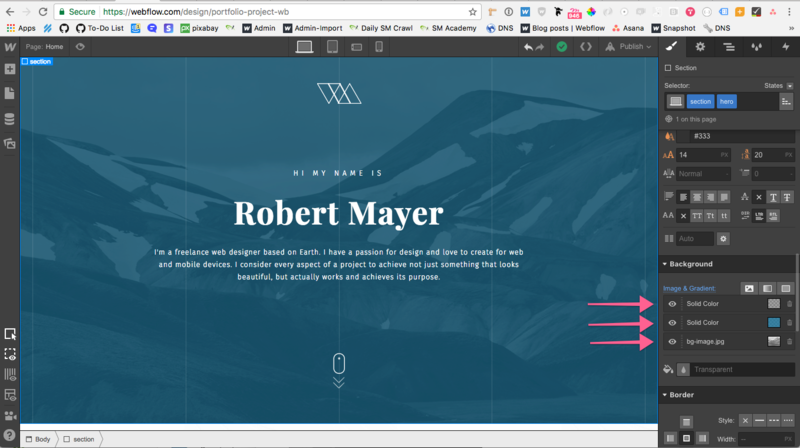 Throughout this post, I’ll be working on building a Webflow site based on Robert Mayer’s freebie PSD portfolio design. I used to think that this was a very tedious task, but Adobe created a wonderful “Generate Image Assets” feature that makes the process much faster and easier. Make sure the names are production-ready, as you'll be exporting them in the next step. Give all your image layers production-ready names. 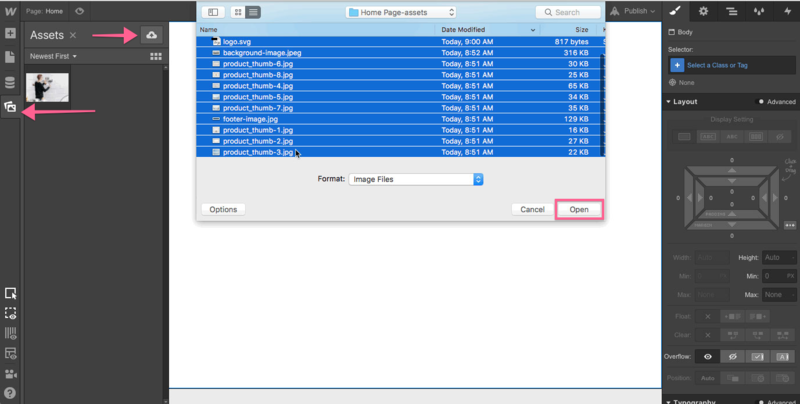 This will create a folder containing all your image assets. They’ll have the names, formats, and image sizes you defined in Photoshop. Generating image assets automatically creates and exports your PSD's images to one folder for handy uploading. 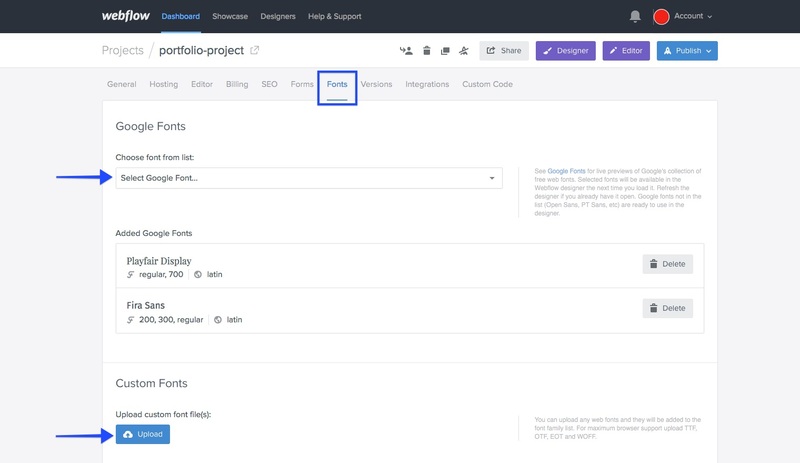 Once you’ve created a new Webflow project, go to the Fonts tab in the project’s settings and add all the fonts you need. You can choose from any font in the Google Fonts library, any fonts you own, or connect your Typekit account to add fonts from there. You can use fonts from Typekit, Google Fonts, or your own personal collection in Webflow. Just be sure to only select the weights you need! Whether you’re uploading fonts or selecting them from Google Fonts or Typekit, be careful to only select the weights you need on your site. Every font weight you add to your site adds to the total file size, and hence, load time. 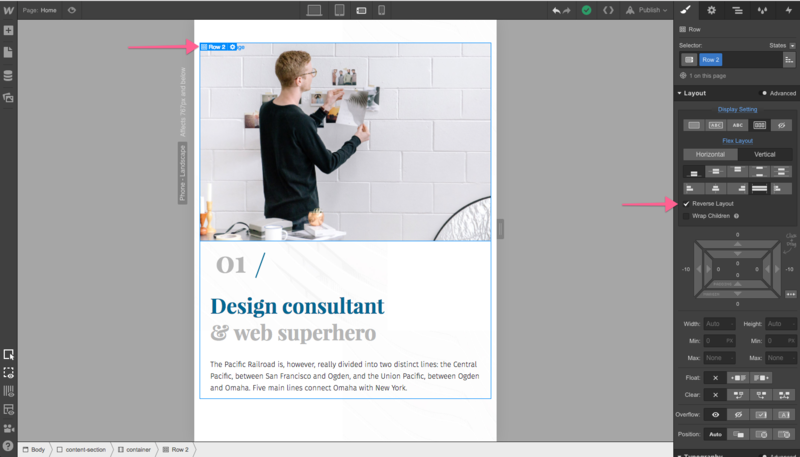 In the Designer, open the Assets panel and add all your images, either by dragging and dropping them in, or clicking the upload button (the cloud icon with the upward-pointing arrow). Either way, you can batch-upload your images. 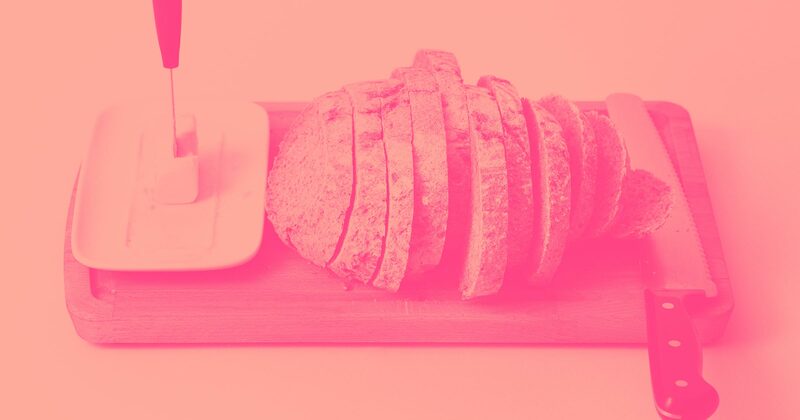 Batch-upload images to the Asset Manager so you'll have all your images ready to go in Webflow. 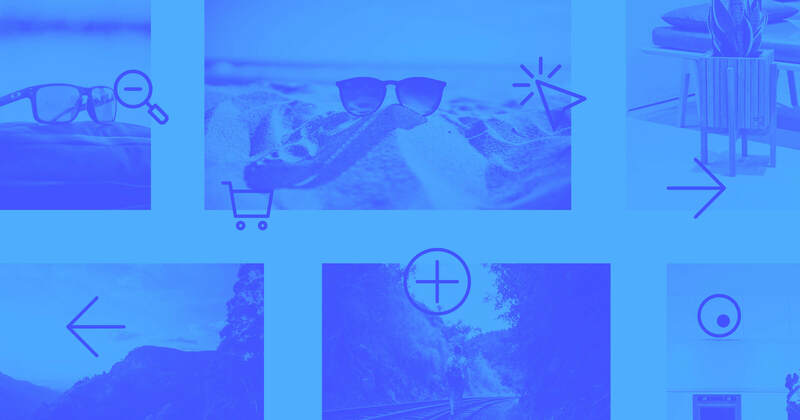 Creating a style guide in Webflow allows you to adjust global site styles in one place, so you can quickly update your design when your client decides they don’t like the headline font, or wants a different shade of blue. 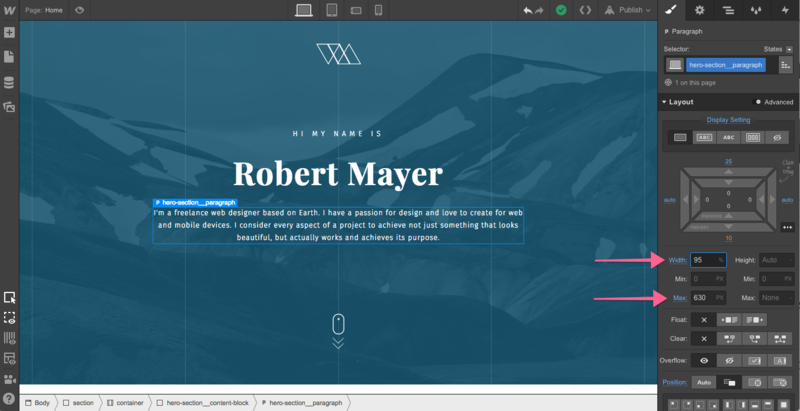 You can create the style guide either as its own page of the site, or make it a Symbol so you can easily add and delete it from pages while you work. H1 through H6 headings. Be sure to style your global selectors (i.e., “All H1 Headings”) for each heading level. Paragraph. You may need to have separate paragraph styles for long-form and other content. Button. Don’t forget to style its different states! Colors. Be sure to save all your custom colors as global swatches. Making your style guide section into a Symbol makes it easy to drop into any page for reference, then delete. 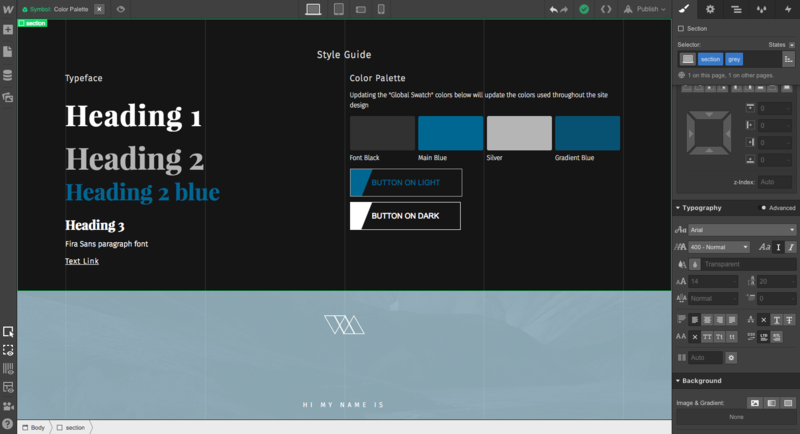 Turn your entire style guide section into a Symbol so it’s easy to add or delete from any page. 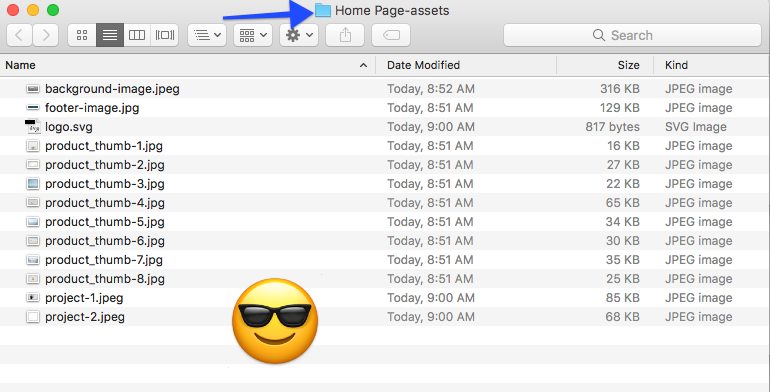 This is handy as it allows you to have the style guide on the page you’re working on for reference, and can easily delete it when the page is done. You can also add light and dark variants of text elements and logos. Handy if page backgrounds will differ in color. We mentioned adding colors to the style guide in the previous step, but it warrants a little more attention. 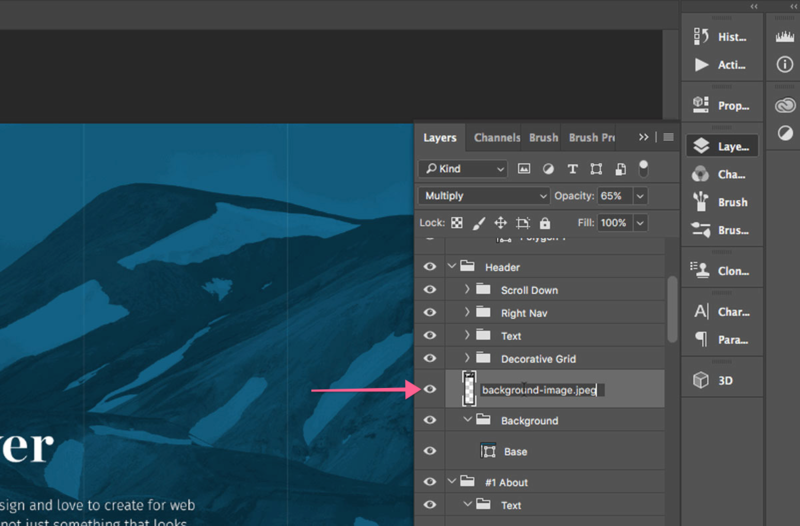 Add a div block to your page and give it a background color from your Photoshop design. Use the eyedropper to select the color in your PSD and paste the hex code right into Webflow to ensure you’ve got just the right shade. Then save the color as a global swatch and name it appropriately. Repeat until you’ve got your entire color palette locked down. With each swatch saved globally, you’ll be able to quickly and easily apply the right colors across your site — and even update them as needed later. 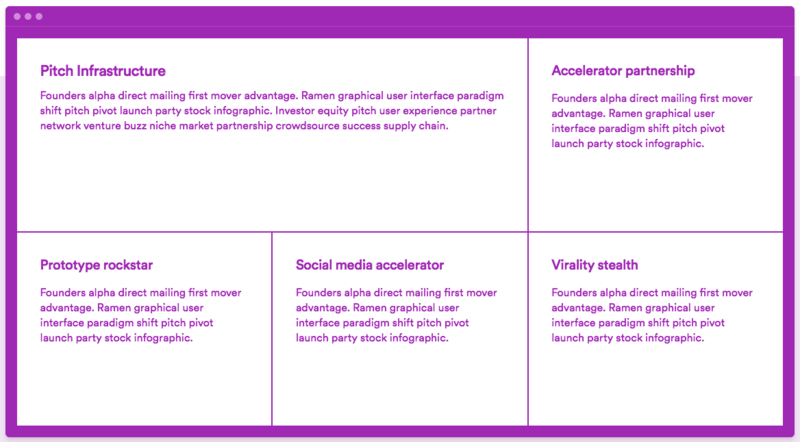 Add your brand colors and make them global so they'll be easy to reuse and update later. Elements such as your site navigation, footer, contact form, and more often don’t change from page to page. As you build out these global elements, be sure to make each into a Symbol. 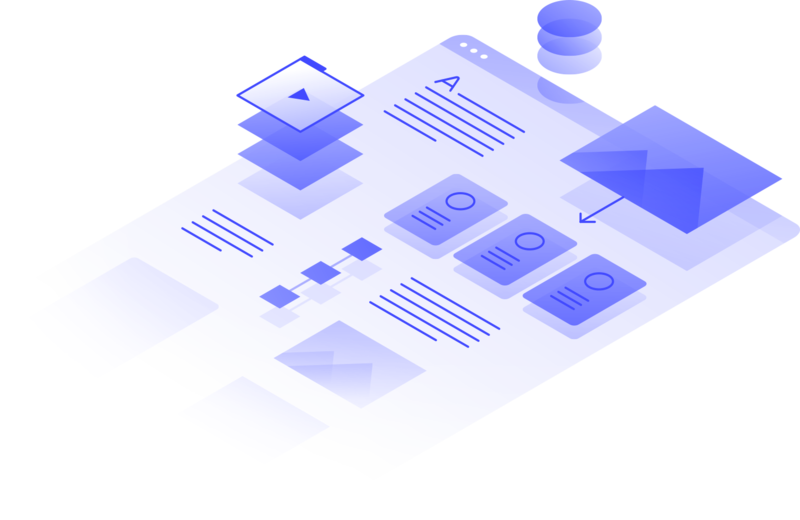 Symbols allow you to turn any recurring element into a reusable component, and to keep all instances of that Symbol synchronized across your site as you make updates. 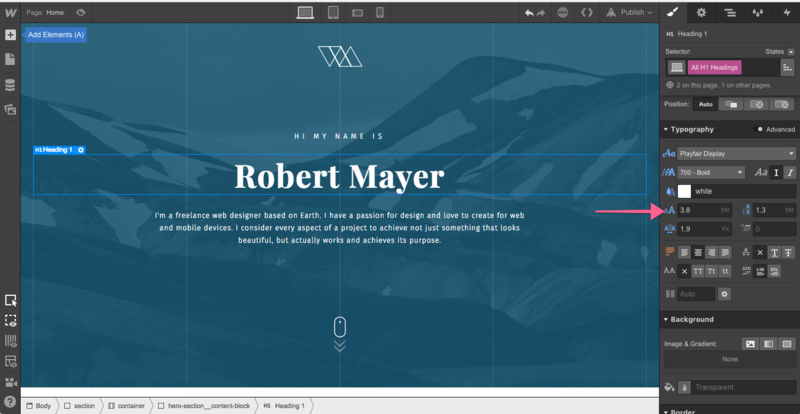 That way, you can quickly add global elements to each page that needs them, vastly speeding up the design process. Turn recurring, global elements like footers, nav bars, and contact forms into Symbols so they're easy to reuse later. When you’re working from a PSD, it can be all too easy to get stuck in a pixel-based mindset. But to simplify the responsive design process, you need to think in relative not fixed units — and for much of your site, that means thinking in percentages. Doing that will save you a lot of work as you adjust your design for smaller devices. Set your Sections to 100% width, relative position and have them clear: left. This ensures that child elements stay within the parent element and that the section doesn’t collapse at any point. I also do this out of habit as Internet Explorer requires fairly explicit style directions. Flexbox is a powerful layout tool that can dramatically speed up your workflow, especially when you’re trying to vertically center content, evenly distribute elements, or change element positions at different breakpoints. I typically use basic box model styles like relative, absolute, and fixed positioning — but that’s just because I grew up in a world where people were still using IE8. Reverse layout: Layouts that alternated between “text-left, image-right” and “image-right, text-left” used to be difficult to handle on mobile. But with flexbox, you can just click the “reverse layout” checkbox to ensure that images consistently display above or below text. While this design looks beautiful on desktop, it will inconsistently alternate text and image on mobile. By reversing the layout, we can ensure that the page consistently alternates between image and text. Believe it or not, vertically centering elements within a container used to be pretty hard. 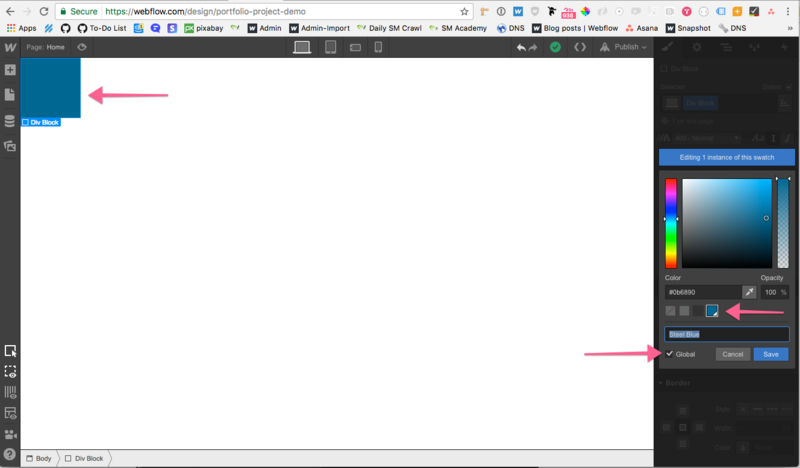 Flexbox makes it one-click-simple. 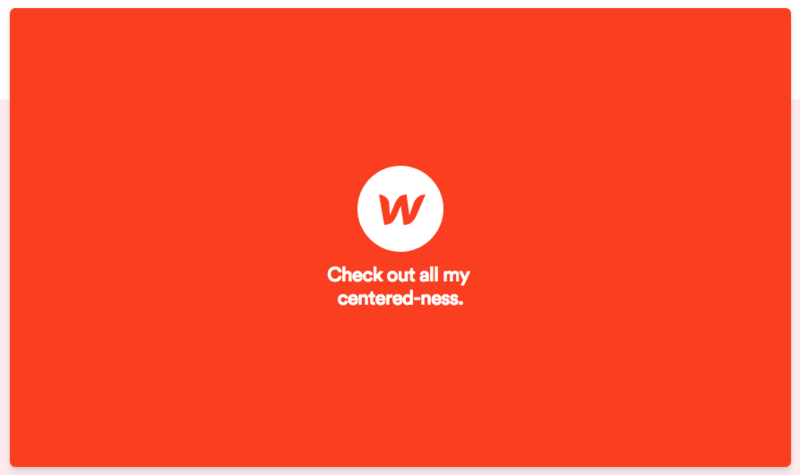 Flexbox also simplifies the creation of fluid grid-based designs. Then use a background image. However, note that elements with background images are more difficult to reuse (unless you’re serving the background image dynamically), as you’ll need to add a combo class to avoid serving the same background image again and again. Otherwise, use an inline image. Webflow automatically resizes inline images for various devices, and you can easily add alt tags to them. Plus, they're easier to reuse than elements with background images. Background images give you the freedom to layer multiple background effects. I get this question often, so I thought I’d add a quick tip here. If you’re trying to separate content from other content, use margins. If you’re trying to keep content within a certain area or add space around an entire component (like a hero section), use padding and width styles. In other words, margin adds space outside an element, while padding adds space within an element. I know how tempting it can be to start building out interactions and hover effects, but hold off till your static design is done. Getting lost in the weeds wondering how a card will transform as a user interacts with it can seriously slow down the rest of your site build. If you’d like to see another article covering animation in site design, let me know in the comments! Now that you’ve successfully added your assets, basic styles, and fonts to your site, your workflow speed should improve drastically. This process usually takes anywhere from 5 to 30+ minutes depending on the size of your site or PSD files and complexity of the design. 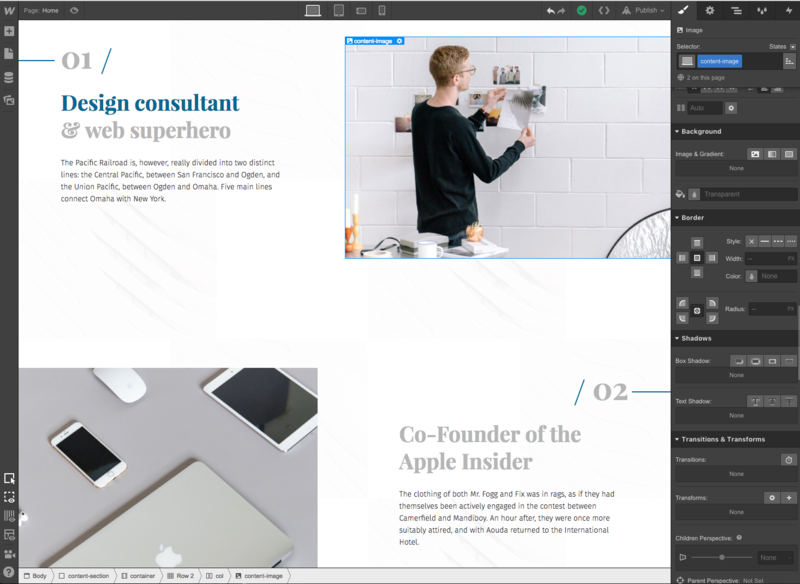 With this process outline and tips, you should be well on your way to faster, easier transitions from Photoshop to Webflow. If you have any tricks or tips of your own, please share them with the community in the comments!